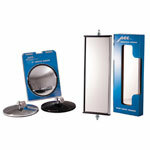 American Chrome’s premium quality OEM–grade Mirrors are available in heavy-gauge chrome and stainless steel. Compared to other brands, our Mirrors offer exceptional quality and value. For a list of top selling American Chrome Mirrors for your showroom, please contact us today.